The City of Lost Fortunes is eligible in the Novel category for the Hugo, the Nebula, the World Fantasy, and the British Fantasy awards, as well as the awards for first novels like the Compton Crook, the Crawford, and the Golden Tentacle Awards. “The Independence Patch” is eligible in the Short Story category for the Hugo and Nebula awards. As a newly published author, I am also eligible for the Campbell and Sydney J. Bounds awards. If you are able to nominate and vote for any of these awards, I’d appreciate you keeping my work in mind. Just being a part of the conversation with all the amazing stories and novels published this year is a dream come true. This past weekend I experienced a few writer firsts, so I thought it was about time I wrote my first blog post. 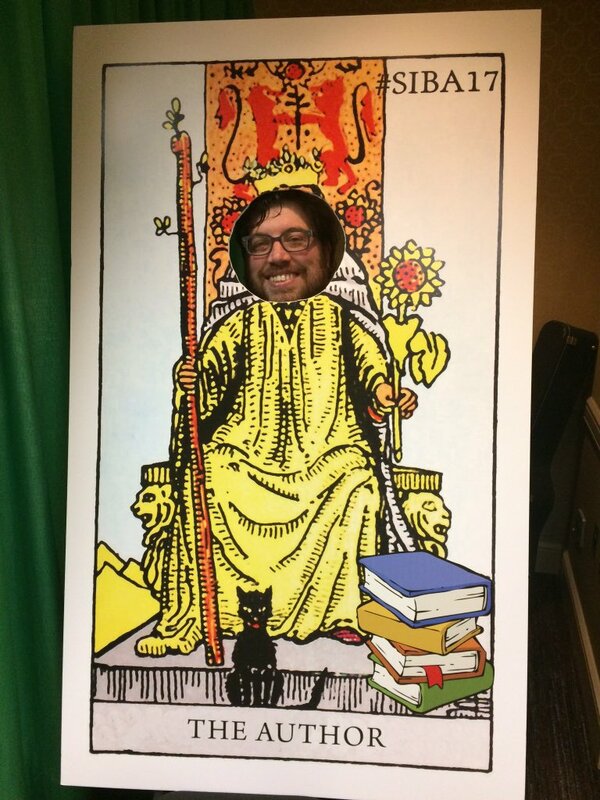 The Southern Independent Bookseller’s Alliance had their trade show in New Orleans. Publishers send along ARCs (Advanced Reader Copies) so that bookstore owners can get an early introduction to the books that are coming out next year, like mine. The biggest of all the firsts that occurred this weekend was that for the very first time, I saw my name on the cover of a book that I could pick up and hold and clutch to my chest and call in Precious in a Gollum voice. (I didn’t actually do that, but it was touch and go there for a minute) The timing on getting these ARCs printed and to the show was pretty tight, so they sent them here before they went anywhere else. So this was the very first look I got at my own book in the real world. I’d have to photoshop in some singing angels and prancing unicorns to accurately capture what this moment felt like. Fun Fact: I was at the HMH table because I was told I should carry around a copy of my book at the conference and didn’t have one. The wonderful HMH sales reps Jen and Andy had already set up the table, but weren’t there because the floor wasn’t really open until the next day. So technically speaking I snuck in and stole a copy of my own book. I’m not saying I’m going to abandon this whole writer thing for a life of crime or anything, but I will say my first foray into the world of gentlemen thieves was fairly fruitful. You can tell I’m a professional because I wore a suit to work. The actual event I was there for was the “First 180 Days” party, where authors with books coming out at the beginning of the year signed copies of their ARCs for interested booksellers. We authors were seated at tables along one wall of a ballroom, while snacks and an open bar occupied the wall across from us. I knew right away I was among my people because when they opened the doors, the booksellers rushed in and made lines in front of the people giving away free books, not the ones giving away free booze. Here’s where my other first of the weekend happened, my first time signing books! Swish and FLICK. Swish and FLICK. Wait, crap. That’s Wingardium Leviosa. This was a blast, pure and simple. I met a bunch of enthusiastic readers and booksellers and got to tell them about this story that’s mostly just been in my head for almost a decade. Everyone seemed thrilled, but that might have had as much to do with the aforementioned open bar as my scintillating personality. The next day I hung around the HMH table and talked about books all day. So what I’m saying is that this weekend I was basically living my best life. Also, this happened. If you put up one of these things with the word ‘Author’ on it, I’m obligated to take a picture. It’s in my contract. And that was how my very first time in public as a professional author went. Special thanks to everyone at SIBA for putting on a great event. Everything ran smoothly and the staff were gracious and helpful. I hope the booksellers had as good a time as I did. And a huge thanks to Jen Reynolds and Andy Snyder and everyone else at HMH, you’re all just plain awesome.